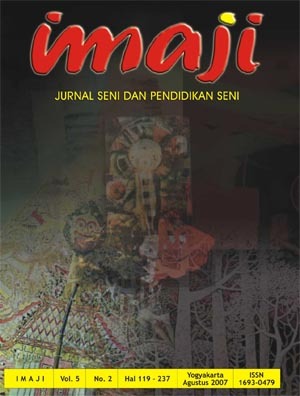 IMAJI is a journal containing the results of research/non-research studies related to arts and arts education, including fine arts and performing arts (dance, music, puppetry, and karawitan). IMAJI is published twice a year in April and October by the Faculty of Languages and Arts of Universitas Negeri Yogyakarta in cooperation with AP2SENI (Asosiasi Program Studi Pendidikan Seni Drama, Tari, dan Musik se-Indonesia/Association of Drama, Dance, and Music Education Study Programs in Indonesia) based on the MoU Number: 17/AP2SENI/2017 and the MoU Number: 511/UN34.12/VIII/TU/2017. Your submission is categorized into two: Active and Archived Submission. Active submission means that your submitted manuscript will be subjected to the review process. If your submission status is Archived, it means that your manuscript is declined. Please, notice your submission status. Click here to submit a new article.